If asked what I remember most vividly of this month-long journey to Việt Nam and Laos, I would have to say: faces. This trip was one of encounters and exchange, beyond the language barriers, which I found easily broken by a simple smile. My first images of Viêt Nam, as the plane descended, were of a land glittering under the sun: water soaked the fields beneath me, where I could make out workers in conical hats and placid water buffaloes. Because there is such a thing as cosmic humor, my first conversation with a Vietnamese took place in Italian, on the minibus connecting the airport to the old city. 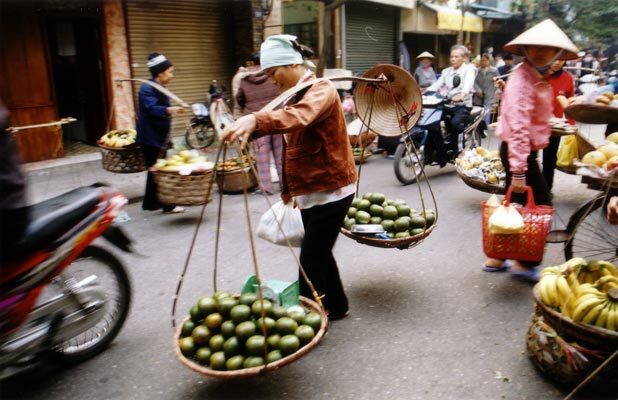 Ha Noi is an ancient city, though that name is the last in a long line. King Ly Thái Thô, whose statue now stands near the old city, was the one to move the capital there in 1010, under the name of Thang Long ("Ascending Dragon"). 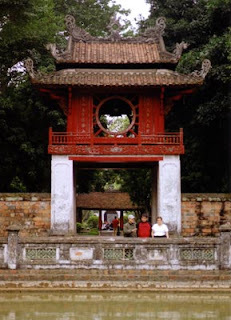 More prosaically, Ha Noi, its name since 1831, means "Within a river", referring to its situation on the Red River. 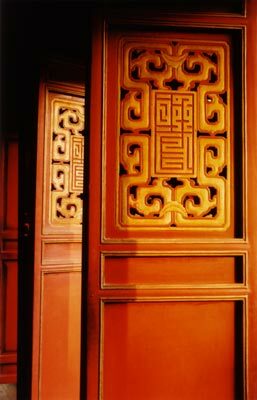 An interesting detail is that the rulers who built there did so based on sound Feng Shui principles. So my guidebook informed me before I arrived. It also warned that Ha Noi was "noisy", but that didn't prepare me at all for what I found upon stepping out of the bus. 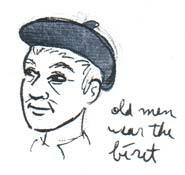 My journal notes: "A city invaded by scooters, bicycles, and their respective honks". 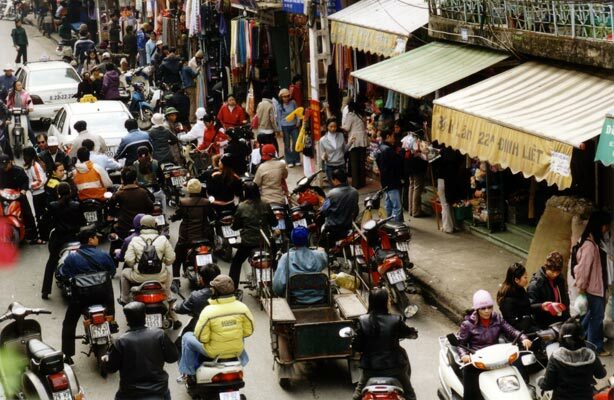 Picture wide streets crammed with a multitude of two-wheelers that outnumber cars by 100 to 1 and fill the air with their incessant buzzing and honking. Picture trying to cross the street when what you have to worry about is not two lanes of cars but a dozen lanes of bikes with no sense of traffic regulations. I was told that in Saigon, the locals crouch on the sidewalk to watch foreigners cross, and clap when (if) they succeed. Walking and driving in Beirut seemed like just a warm-up for taking on Viêt Nam. Weaving confidently through the traffic are the ubiquitous shoulder basket bearers with their conical hat, baskets that can contain anything from fruits to metal scraps. Often, underneath the goods, is stored a portable heater, as they make and eat lunch on the sidewalk wherever they happen to be. 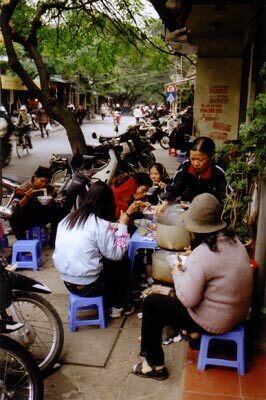 As a matter of fact the Vietnamese live on the sidewalk outside their shop, and at mealtimes entire families sit outside on tiny stools to gulp down their food. As the rest of the sidewalk is used to park motorbikes, the only place to walk is the street itself, where one is constantly solicited by the moto-taxis' calls: "Woo-oo! Motobike?" Add to this the constant "Anh oi!" "Chi oi!" "Em oi!" 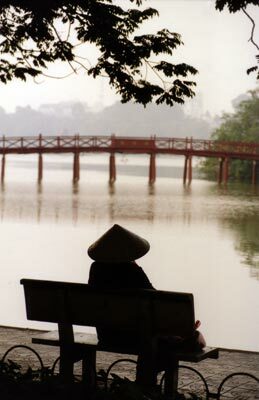 etc of people calling to each other (and, worst of all, the loud expectorating) and you can start imagining just what a headache Ha Noi is. And I'm not even going to describe the smells! Clean it is not, by any standard. It seems the Việt's lives have always been more or less this way (I'm referring here to the ethnic Viêt, also known as Kinh, as opposed to the Vietnamese nationality which includes the country's other 53 ethnic groups.) A restored old house provides insight into the past and how it trickled down into the present: the traditional house is narrow, its façade at most 3 meters wide due to an old law. The shop, which has no door but gapes onto the street, occupies the front. Behind it is a workshop where the children sleep. On the upper floor, only open to very close friends of the family, is the parents' bedroom. The workshop is not separated from the upper floor by a ceiling, so that the lady of the house can sit upstairs and embroider with a view on the shop. All these aspects I noticed in today's homes; when there is no shop the front room is the family living room and in the evening you can see them park their motorbike between the sofa and the TV and pull down an iron curtain to "close for the night". The houses are still very narrow (I think there's a habitation tax involved that is based on the façade width) and they make up for it in height and in depth. Vietnamese houses are the strangest architectural creatures things I have seen. The tall narrow façades are highly ornate and vividly coloured, borrowing freely from Western posh styles, while the other sides of the absurdly long rectangle (where one can guess how the rooms are arranged in a single row) are left in bare, windowless concrete. Outside the city, where space is not an issue, each house stands alone and the above is even more visible. 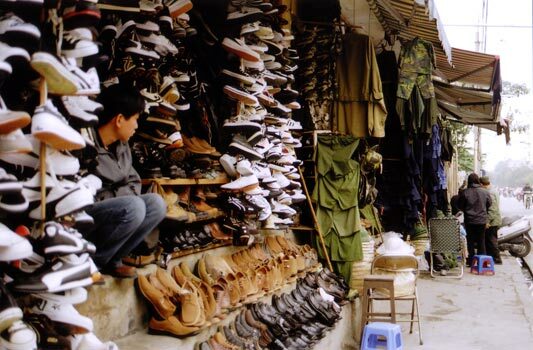 Ha Noi's main interest, frankly, is how cheap it is. It is worth traveling there for the sole purpose of filling up on clothes, handicrafts and the wonderful silk that is so readily available. Otherwise it's good to touch down between tours to other and more interesting parts of the country (though it seems the best way to enjoy Viêt Nam is to stay on the move). But what saves the city from being a dreary crowded place is its population. 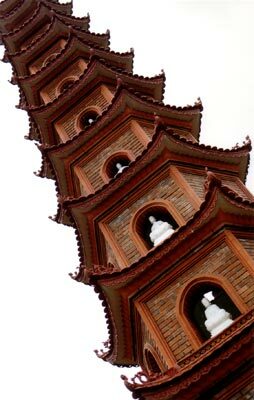 The Vietnamese are startling at first; they don't have the same notions of "proper manners" as we do, so it's not uncommon to be roughly tapped on the arm or called out "You!" It's important to realize no rudeness is intended, and behind those unpolished edges there is no hostility but an informal attitude that's often humorous. This is just the way they interact, even amongst themselves. It's also important to resolve everything with patience and a persistent smile, as losing face is to be avoided at all costs and it would be very humiliating for them to be shouted at – in Việt Nam, you just don't get angry or raise your voice. before she has the time to understand what happened. Though it is true that most people there see you as a potential source of cash (and in view of the poverty, who can blame them for justly estimating that the single dollar that means so much to them means nothing to you), the people are genuinely friendly and helpful. They are curious and cheeky, which means that if I'm sketching in my booklet, they come to look right over my shoulder; if I can't get my "motobike" started, they come over and start it up for me; if they like my eyelashes (and Vietnamese women immediately noticed them), they approve loudly: "Oooh, very nice!" Street sellers who couldn't convince me to buy something from them would drop the marketing routine and strike up a conversation instead, with the little English they knew. Everybody wanted to know where I'm from, and when I said "Li Banh", would be satisfied to note: "Ohh you from Asia too!" For my part I was satisfied that first, they almost all know what and where Lebanon is, and second, they know it's an Asian country (something the West, intent on chopping the world into smaller pieces, tends to forget). 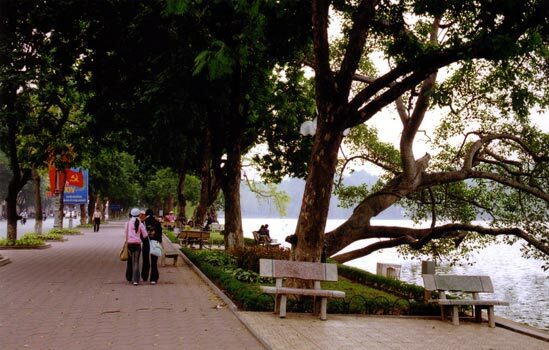 Hoàn Kiêm Lake, heart of the old city, on the shores of which the locals gather to relax and enjoy the view. 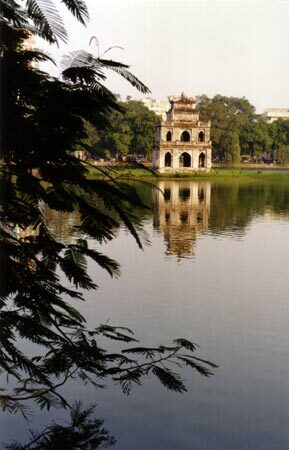 I won't elaborate on every monument, but a word needs to be said about Hoàn Kiêm lake as its story is prominent in folklore and the locals' minds. A legend from the 15th century says that a fisherman named Lê Loi was entrusted with a magic sword by the lake's sacred turtle. 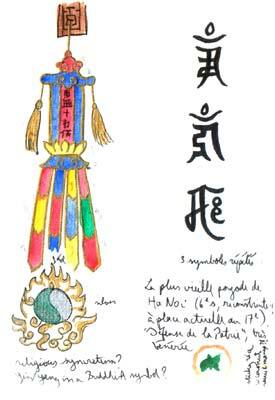 Thanks to the sword, Lê Loi was able to arouse the Viêt and push back the Chinese army. Eventually, once peace had been achieved and as he strolled along the water, the turtle appeared and reclaimed the sword, which Lê Loi accepted to return. The lake has been known as Hoàn Kiêm, or "Returned Sword" since. What's interesting is that the lake really does harbor a species of giant turtle, also known as Swinhoe's softshell – but sadly, they are so rare they're virtually doomed to extinction. 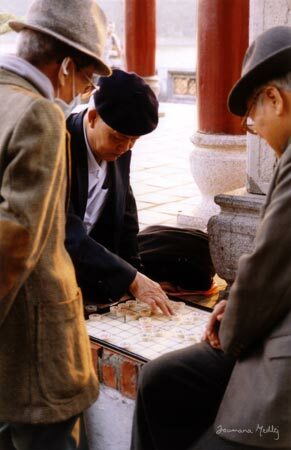 A game of Vietnamese chess outside the Ngoc Son temple on Hoàn Kiêm. 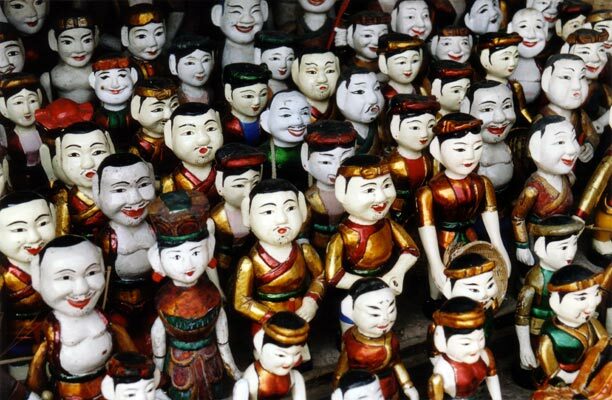 Water puppets are a Vietnamese tradition, born in the flooded ricefields. Shows are played in a theatre by the Lake. 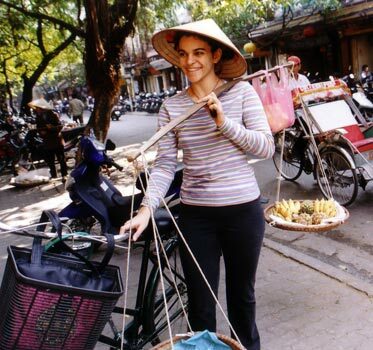 I rented a bike throughout my stay in Ha Noi, which allowed me to really enjoy the city at its own pace and go places I wouldn't have gone on foot. 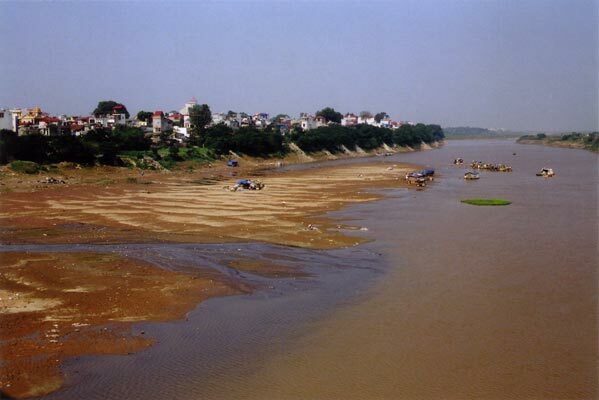 The Long Biên bridge is an example: it spans the Red River, and is thoroughly enjoyable to cross. Fields in the Red River: suddenly you're in the countryside, and it's the most quiet place in Ha Noi, too. 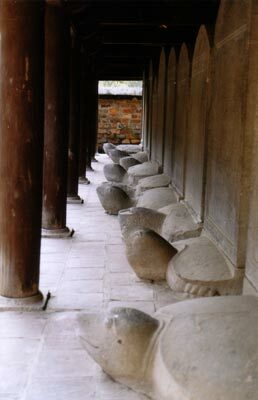 One monument really worth the detour is Văn Miêu, the Temple of Literature, founded in 1070 for the cult of Confucius, Chu Công and other eminent scholars, that became the country's first university. It is considered a national symbol of culture and education. With its succession of gardens and lotus ponds, the Temple is a haven of serenity away from the city's bustle. 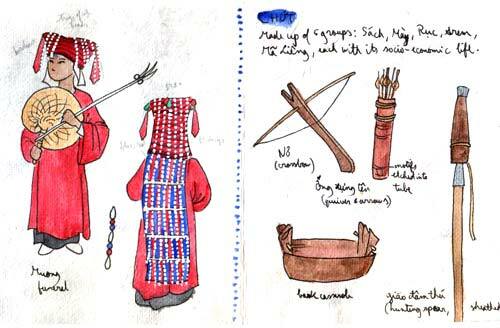 A group of musicians animate the final court, and there's a bookshop (appropriately) that I pillaged for books on the hilltribes (as the ethnic minorities are referred to here). 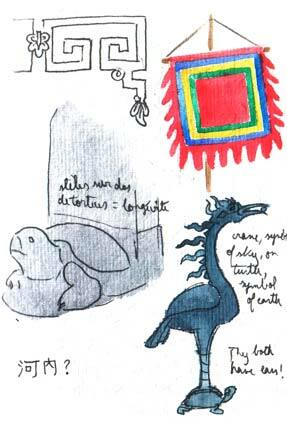 the turtle is a symbol of longevity. 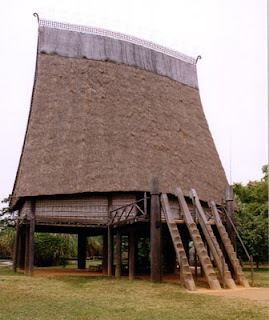 a staggering 19-m-tall Bahnar communal house. There is a very serious effort in this country to document and support the traditional lifestyles of the minorities; this effort finds its peak in the stunning Museum of Ethnology, a treasury of images, multimedia and artefacts from Việt Nam's 54 ethnic groups (as every Vietnamese will proudly tell you.) The museum is a collaborative effort with France, and it shows: in terms of circulation and presentation it beats nearly all the other museums I've seen, with detailed labels in 3 languages. It even has a dozen authentic tribal homes built in the museum grounds, complete with furniture and daily objects. It might be enough to say I spent a record-breaking 7 hours there, and I was in a hurry because I wanted to bike the 10 km back to my hostel before dark. 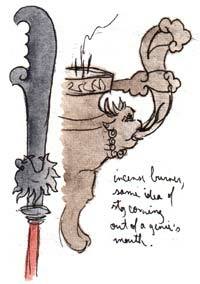 The sketches below are a mere extract of the 26 pages of notes I made there, on a concertina booklet I bought in Laos just for the occasion. It unfolds to a length of 360 cm.... Click to see it all.